Over one crore sarees worth Rs 222 crore will be distributed to eligible women. Of the total, around 52 lakh sarees were procured from Telangana weavers. Distribution of Bathukamma sarees has been started across Telangana State on Monday. Hyderabad: The distribution of Bathukamma sarees kick-started on a grand note and to a huge response from women across the State. 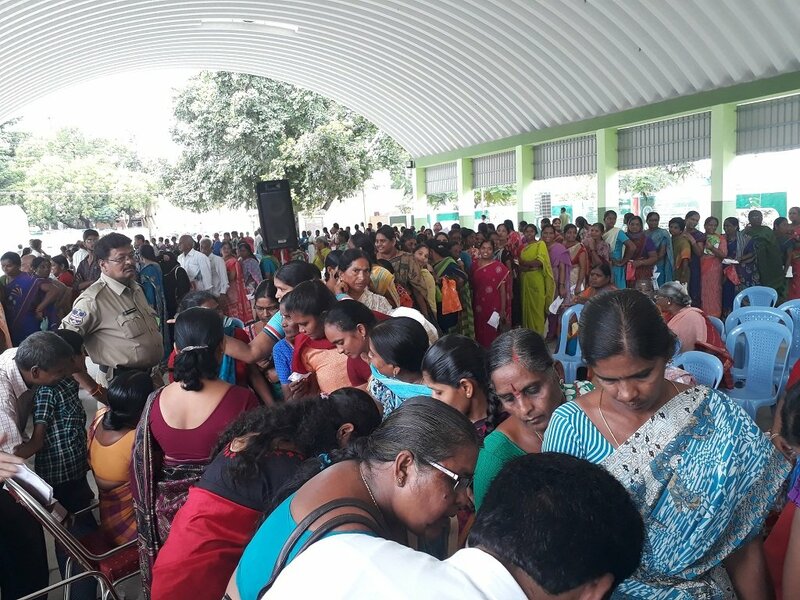 Women turned up in large numbers and waited for long hours to get their Bathukamma sarees on the first day of distribution which will continue till September 20. At a few places in erstwhile districts of Hyderabad, Karimnagar and Nizamabad, women indulged in fist-fights to get sarees with designs and colours of their choice. Handlooms and Textiles Minister KT Rama Rao launched the programme by distributing sarees to women at Mustabad in Rajann-Sircilla district. Similarly, Ministers and elected representatives distributed the sarees in their respective districts. While Deputy Chief Minister Kadiyam Srihari launched the scheme in Warangal, Ministers Talasani Srinivas Yadav and T Padma Rao handed over sarees to beneficiaries in Hyderabad city. MP K Kavitha distributed sarees in Nizamabad district, while Bhongir MP Boora Narsaiah Goud, Munugode MLA K Prabhakar Reddy and MLC Karne Prabhakar distributed sarees at Choutuppal in Yadadri-Bhongir district. However, trouble broke out at a couple of distribution centres especially in Chelgal of Jagtial district soon after distribution commenced after youth leaders of some political parties snatched away sarees from the beneficiaries and burnt them, alleging that the sarees were of poor quality. Irked over it, the beneficiary women lodged complaints with the police demanding arrest of the accused. Irrespective of caste and religion, women waited in long queues at the venues of the Bathukamma sarees distribution to get the gift from the State government on the occasion of Bathukamma festival. Nearly 25 lakh sarees were distributed through nearly 10,000 centres on the first day of distribution and the remaining sarees will be distributed over next two-three days. As around 20 lakh sarees are yet to reach distribution centres, officials said that they would extend the scheme for more days to complete distribution after considering delay in supply of sarees. “The district collectors are monitoring the distribution on a real-time basis. We will extend the distribution dates based on their feedback,” said Shailaja Ramaiyer, director of Handlooms and Textiles. Around 1,04,47,610 sarees worth Rs 222 crore, will be distributed to eligible women across the State marking the celebration of Bathukamma festivities. Of the total, around 52 lakh sarees (about 3.7 crore metres of cloth) were procured from Telangana weavers. Sarees in over 500 designs and colours, are being distributed to women aged 18 and above through the distribution centres. Beneficiaries have to produce their white ration card to avail the scheme. The scheme was launched by the state government to achieve dual goals of providing employment to weavers in Telangana State and also help women celebrate the Bathukamma festival with pomp and gaity. Speaking to reporters at Hyderabad on Monday, Handlooms and Textiles director Shailaja Ramaiyer said that the efforts of the government are paying off as around 20,000 powerloom workers have benefited from the scheme whose salaries have gone up from about Rs 12,000 to Rs 20,000 due to increased business for powerloom industries. The director explained that textile industry is also looking towards for technology upgradation and product improvement including new cloth varieties and new designs, after this initiative. “With the initiative of Minister KT Rama Rao, we are catering to textile requirements of hospitals and KCR Kits under Women and Health department, Tourism and others departments. Thus, textile companies are exploring possibilities of producing other cloth varieties such as bedsheets, curtains and other such requirements,” she added. She asserted that the sarees being distributed of good quality and are made from polyester to ensure durability.